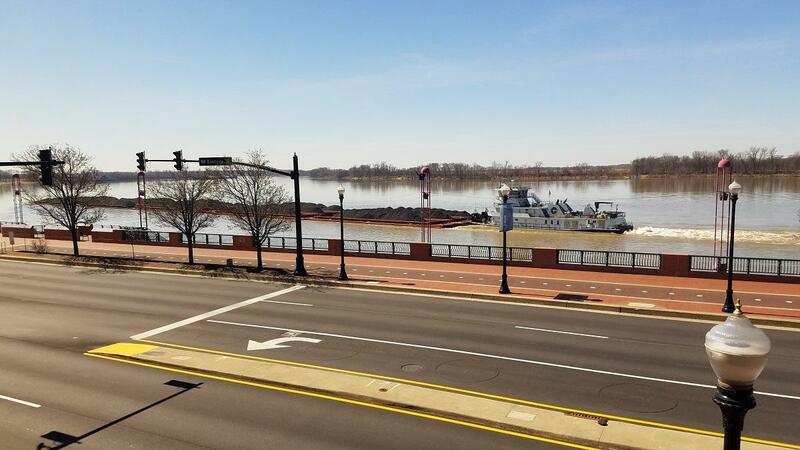 A barge tow headed up river at the bend at Evansville. It is the most prominent geographic feature in our lives, but how much do we really know about the Ohio River? Join us for this journey from Owensboro to Mt. Vernon when we look at all things along, on and under the river. That’s ORSANCO Executive Director Richard Harrison speaking with WNIN’s John Gibson on Dress Plaza. The University of Southern Indiana (USI) men's basketball team declared victory over West Texas A&M during the NCAA Division II Elite Eight quarterfinals last night. Red Blue Hoops Co-Host Chad Payton thinks so. For our Day Out on the Ohio River, we're telling the stories of the river’s past, present, and future. A major part of that future is a planned Interstate 69 bridge over the Ohio between Evansville and Henderson. You’ve probably seen plenty of barges traveling up and down the Ohio River. WNIN’s Isaiah Seibert has. But if you’re like him, you don’t know much about the boats even though you grew up here. Isaiah paid a visit to the Port of Indiana-Mount Vernon to learn more.